“Every morning in Africa, an antelope wakes up. It knows it must outrun the fastest lion, or it will be killed. Every morning in Africa a lion wakes up. It knows it must run faster than the slowest antelope, or it will starve. It doesn’t matter whether you are the antelope or the lion – when the sun comes up, you’d better be running” – African Proverb. 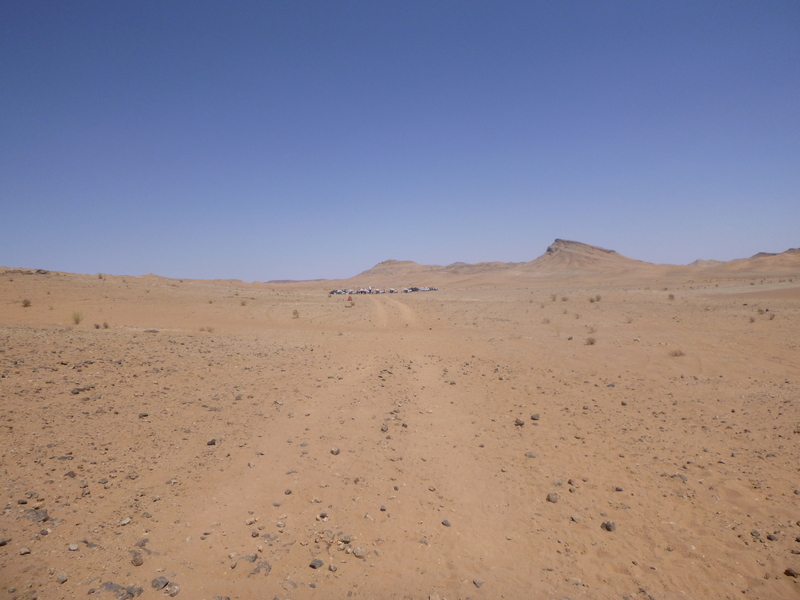 At about 6am, the Berbers began their very efficient routine of taking down camp – to be fair to them they have to take down the whole camp – runner’s tents, medical tents, organiser’s tents, support tents, etc. which all has to be packed up and moved onto the next bivouac and be rebuilt by the time runners start arriving. So they start early, and kindly they start with different tents each day – but they move fast, and before you know it your tent is lifted off and taken down right around you, and leaves you sitting on the rug in whatever state you may be. The first time this happens everyone tends to panic that they should be ready to go by the time the tent comes down – but we still have about an hour to go before we have to gather at the start. 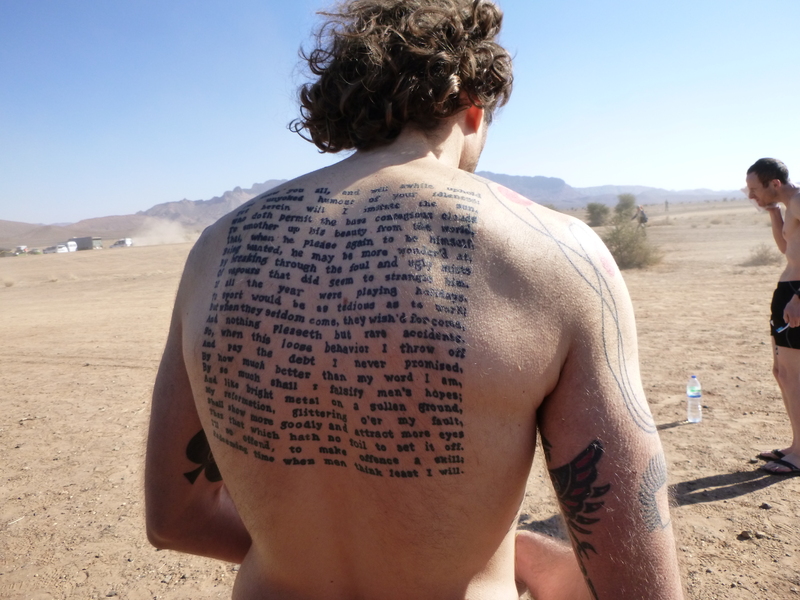 And throughout the week, each day a different member of the Race MDS media would appear at this time to take a photo of Matt’s tatts, which certainly served some amusement. Now normally I wouldn’t slag off or criticise another runner, but it cannot really be avoided in this instance. When the tents come down, it is hard not to glance across at other tents to see how frantic other runners might be, to check out the size of other rucksacks, and honestly size up the competition. Our tent came down, and it was hard not to be somewhat agog at the next door tent. The girl who I had met on the bus was busy with her toiletries applying a full layer of makeup and mascara, complete with mirrer compact, her somewhat substantial amount of kit still surrounding her on the rug. Now, everyone can bring with them what they like to the desert, I remember in 2007 someone had a cricket bat and ball, and in 2012 one very admirable (or not) runner had an ironing board and iron with him. But, it must be said that seeing a full make-up bag amongst her detritus of her heavy looking pack was quite surprising – not only was it going to be hot (the rapidly increasing early morning temperatures were just an indication of what was to come) but surely worrying about how one looked in the desert was not really an essential priority. It just seemed an odd choice – and dare I say it, a fairly unique one as almost everyone else in site was busy checking how they had packed their kit so that essential items were easily accessible, or checking the roadmap for the day’s route, filling water bottles, etc. We mulled over her a while in tent 115, and definitely wondered if we would be seeing her that night in camp! Still each to their own. 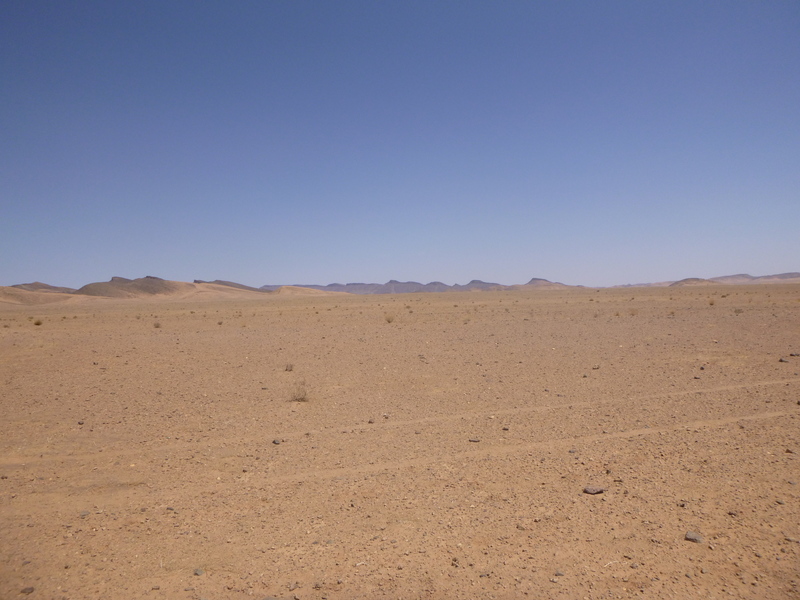 Kilometre 4 – leave the oued from the left side, go south over invariably stony plateau. Kilometre 5.5 – hilly passage. The helpful descriptions like stony terrain are but a mere indication of what is to come. 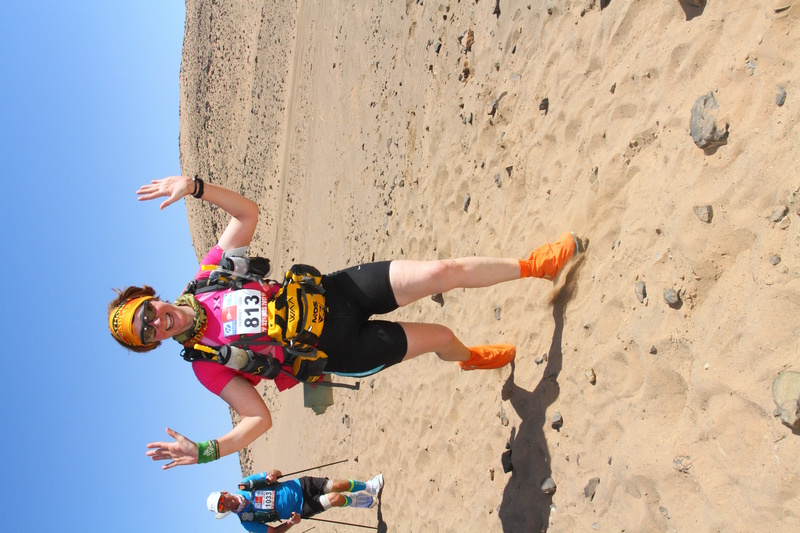 Memory from my past two MDS races is no real help – the terrain in the desert is vast and varied – and not just sand as many people mistakenly think. Sandclouds raised by the media chopper – thanks! And as the chopper flew off to hover over the first few 100 metres of the course, Patrick Bauer greeted us all from atop his customary landrover, setting out the course for us, wish happy birthday to anyone whose birthday it was that day (a daily ritual), and then as people’s adrenalin began to pump and the familiar smell of pre-race sweat pervaded the air, ACDC’s Highway to Hell was blasted out from the speakers and the countdown 5, 4, 3, 2, 1 was bellowed out. We all fist pumped each other, last minute kick checks, photos, declarations of good luck to each other – Kevin disappeared to get to the front, along with Matt, and then we were off. 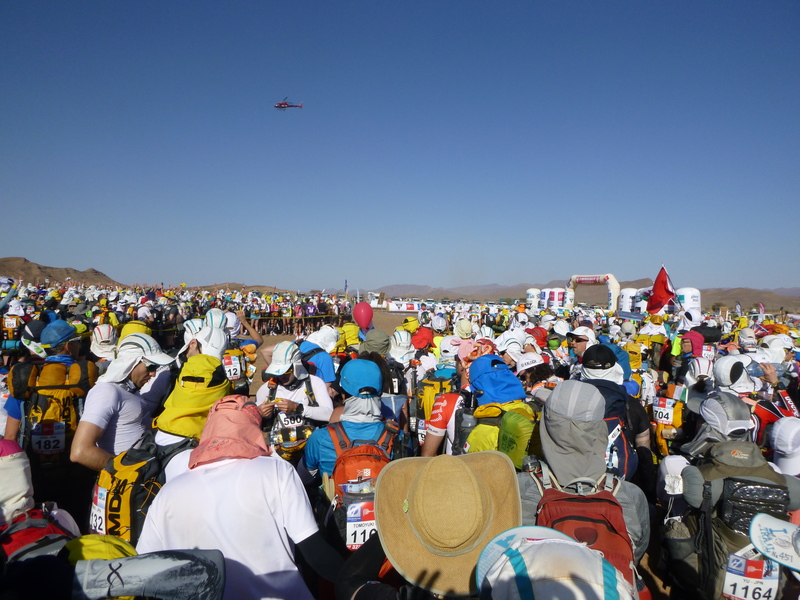 Months, and in some cases years of preparation was done, gone, history – everyone surged forward and headed over/under the inflatable start line, waving at Patrick, waving at the camera men, cheering, waving at the helicopter as it flew sideways away from us heading along the course of dusty stony sand towards the “stony plateau”. We were off…!!!! 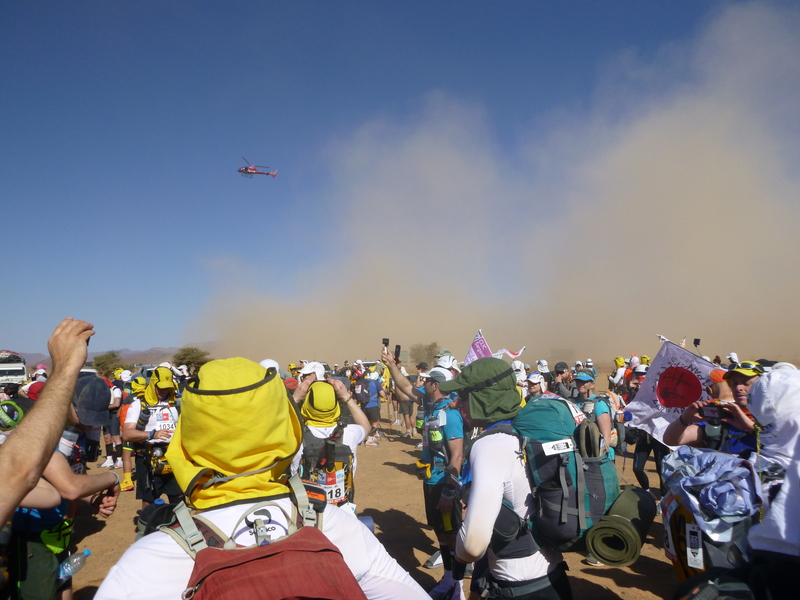 I felt quite emotional – couldn’t quite believe I was really there again in the desert running past Patrick Bauer on his landrover, MDS volunteers (commissaires) cheering us all on, media, Berbers chanting as we streamed past, and the roar of the helicopter above. Was I really starting out again on 150 miles across the Sahara Desert – I raised my eyes to the skies, and smiled – I felt that Dad was up there this time, watching me and no matter what, I’d be ok. So I wasn’t quite as fit as I was 5 years ago, and I knew that I would most likely be walking quite a bit of the race this time – but here I was, the sun was shining and getting hotter, the sky was as blue as a sea of bluebells in springtime, and I was heading out into one of the most beautiful places in the world – with expansive landscapes, vast skies and a variety of fellow human beings to be my various companions along the way – what could possibly be better! 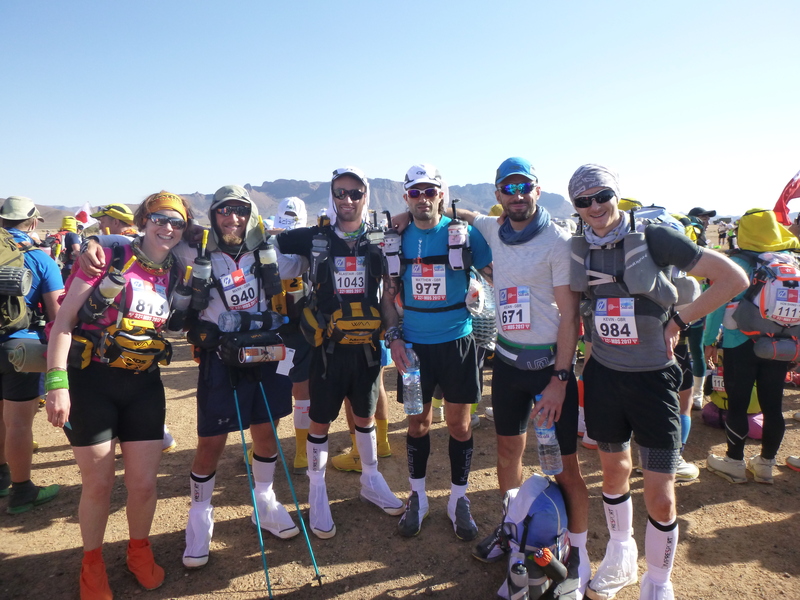 However, what I had forgotten (conveniently or not) was the stones – the stones and rocks that litter the desert far more than most people realise became the bane of my life throughout the race. As the desert heats up, and as you are on your feet permanently, walking or running, your feet heat up as well and become tender. The majority of runners go for trainers 1 or 2 sizes too big to allow for this swelling, as had I. However, once your accidently kick one stone with one or other or both of your feet it begins to happen again, and again…..and again….and again. You run along trying to keep looking up at the wonderful scenery that you are passing through, but every time you take your eyes off the track in front of you, you invariably stub a toe by kicking the one stone or rock in your path that is sticking up. However, stones aside, the first section that we ran through was a mere warm up for what was to come. It was quite a long first stretch of 13 kms to Check Point 1 through stony plains and gentle dunes, but it was good to settle into a stride as the field of runners stretched out ahead and behind like a line of ants disappearing into the distance. And runners began to chat to one another and exchange stories and motivations for the race. Having started around 8.30am it took around 2 hours to reach CP 1, and the heat was rising. And 13kms is a lot longer in the desert than it is back in the UK, and you are straight away aware of the need for your drink and hydration. And the sight of flags, landrovers, and white tents of the check point looming into view was a very welcome one. As always, it was my plan to stick to my routine, go through the number barrier and collect my bottle of water from the cheerful Check point guards who greet each one of us warmly, as they stamp our water tickets. Head for a bit of shade to refill my drink bottles, eat a couple of snacks, make any necessary adjustments to my kit and head off again. However, I made something of a school boy error and having refilled my drinks bottles which were in the holders on either side of my rucksack straps, I bent down to pick my snack bag off the ground and realised too late that I hadn’t secure the lids back on my bottles – suffice to say that most of my drinks poured out as I bent down and I looked rather silly! I luckily had just enough water left to top them up – but only just enough! I certainly wouldn’t make that mistake again!!!! So as I headed off I glimpsed Aiden, Mark & Al, but headed on out in the direction of a “slightly stony plateau” the description slightly simply means small stones rather than rocks! CP2 was just 9 kms away, but it was getting hotter, and there’s no point going to fast on day 1 and knackering yourself – there are after all 6 more long days to come. I fell into stride with some other runners from the UK, France, Japan, Hong Kong, USA amongs many other countries – Freya from the UK, and Jody from Jersey – he was running for his sister’s little girl who has Epidermous Bullousa and was yet one of the many runners I met who with his determination later in the week when he hurt his achilles, made me feel quite humble. The 9kms passed without too much incident, and although I could feel a couple of blisters brewing on both of my big toes thanks to repeated stone kicking, I felt quite strong and comfortable – almost like singing – yes, for those of you that don’t know, I apparently have a tendancy to sing in the desert, and as I approached a stretch and was alone for a bit I gave full voice to my rendition of Les Miserables and a couple of other songs! As CP2 approached it was pretty much the heat of the day, and due to my wastage of drink at CP1 I was quite pleased to arrive there. However, just as I was coming out of the water collection point, ahead of me a fellow male runner collapsed to the floor. Several of us in the vicinity shouted immediately for help, and within seconds the medics (Doc Trotters) were surrounding the guy, and before you knew it he was cannulated and a drip was up (those of you who know me as a nurse will know that I found the speed of cannulation very impressive, being something of a vampire!) and he was quickly stretchered into the medical tent. However, once there the doctors & nurses proceeded to commence CPR (chest compressions) on him, which went on for I would say a good ten minutes. 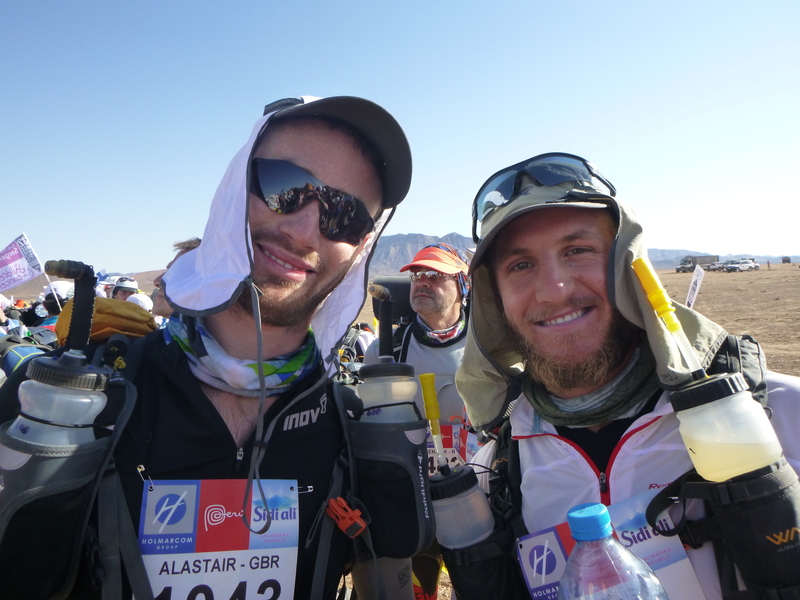 During this period Al, Mark & Aiden appeared through the Check point, we all stood quietly refilling our bottles and munching on our snacks. It was quite sobering, not least because the runner was with his wife who was quite understandably very distraught. It brought starkly into reality that this race is by no means a walk in the park and that the conditions and temperatures that the desert lays down as challenges to us, are to be taken seriously, and the self sufficiency is all about managing yourself with your nutrition, hydration and endurance along the way. One of the things we are provided with by the race is a small bag of salt tablets to take every hour or so to help prevent too much salt loss as you sweat – I necked back a couple as the four of us headed out of CP2. We had about 7/8kms to go to the bivouac. It was hot and I lost pace with the boys, and fell into step with a charming Frenchman called Vincent and an American called Edward, and a young man from Cambridge called Robin who was a policeman. 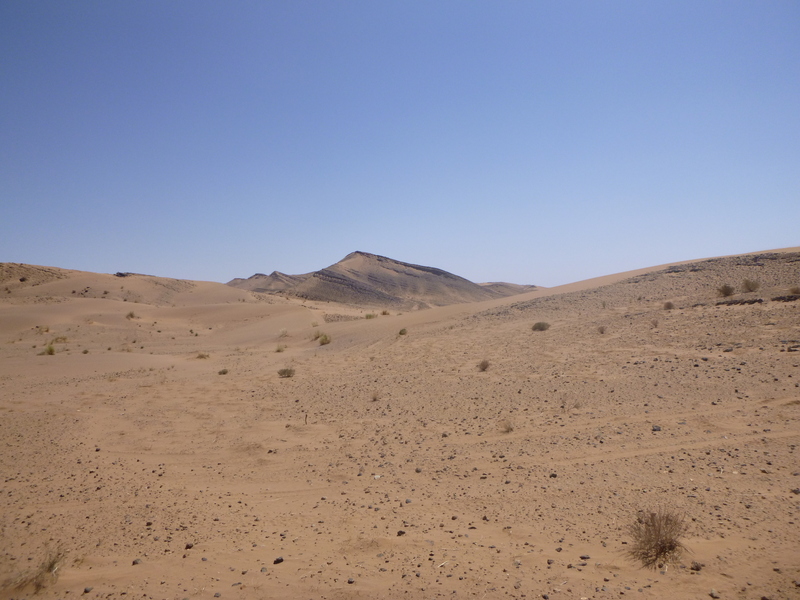 We shuffled along amicably, striding through a hot windless dunefield, along through a deep gorge, again with no wind, and followed a sandy oued (dry riverbed). Towards the end of the gorge we had to cross a “slightly” stony gorge – well it said slightly in the handbook – but quite frankly judging by the amount of stones that made contact with my feet it was a little more than slightly! 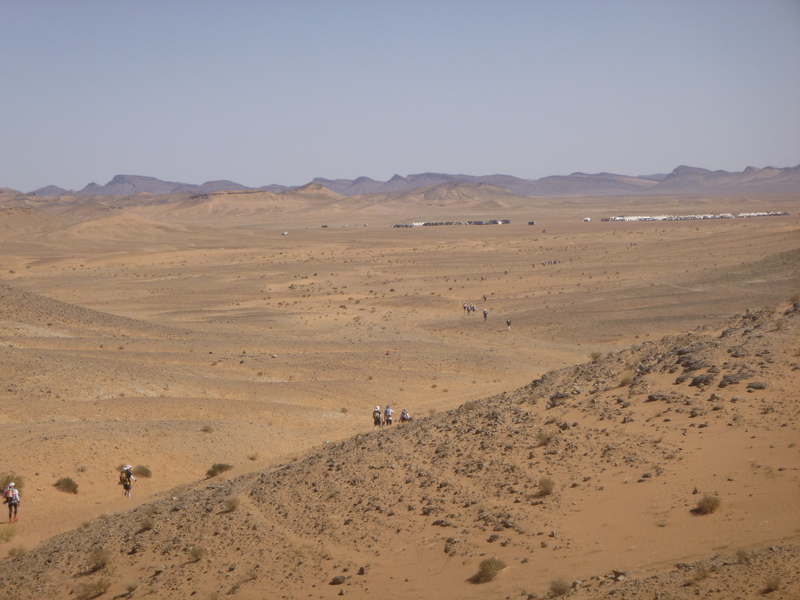 We reached the top of a small hill, and over the rise was a beautiful sight to meet the eyes – in the distance was the Bivouac! And, just ahead of me – well about 400metres ahead I could see Aiden, Al and Mark so ignoring what was now becoming a dull throb in my feet and the fact that I felt quite hot, I gave a small push, picked up my pace and ran to catch them up – as I ran up behind them, relieved that they were ambling along at a rather sedate pace the bivouac loomed ever closer. As we approached the finish line we all crossed together – although on the official times it logs me as the 4th one of us to cross the line – now who was being ungentlemanly – the boys or the timekeepers! But we had done it, we had completed Stage 1, and it was brilliant to cross the line with 3 of my tentmates. We walked past the webcam, I blew a kiss to my family (and of course to any of you who were managing to follow the race!) and walked gratefully to the tent where we were given a tiny cup of Moroccan tea. It is delicious tea and quite refreshing to drink at the end of the stage – but it is a very small cup, and no amount of persuading & pleading will gain you a second cup! So we each headed through the water station collecting our 3 bottles of water each for then night and headed to our tent where we found Kevin & Matt relaxing having made it in quite some time before us – the speedsters. De-rucksacking, and collapsing on the rug is heaven. Post run routines of making protein drinks, quick snacks of biltong, energy bars all consumed. Then for me, taking off my shoes. This was quite a mission, as I had thought I had sensibly saved a bit of money by using my sandgaiters from 2012. Not such a great idea. The zip on them was quite, well, knackered and difficult to undo, and the velcro on them was also beyond its best and so didn’t stick well to the new velcro around my shoe – suffice to say they were more of a disastrous orange fashion statement than effective sandbarriers and to boot bloody difficult to get off due to the sticky zip! Once off, it was heaven to remove my shoes and my socks. I had taped my toes, but in vein – I knew that lurking under the tape on my big toes and at least one other toe were evil blisters. In this circumstance it is best to let the experts do the job, so I decided before having my main meal I would visit Doc Trotters. Doc Trotters is the medical tent and experts who look after all out medical needs – which mainly consists of feet problems. The queue can be long to get into the main medical tent. So outside they have to lines of chairs and plastic crates, you sit and get to wash your feet with a solution which cleans and somewhat disinfects them as one of the docs acts as a triage nurse and checks out why you are there and what you need. The triage nurse/doctor was an exceedingly fierce and actually quite scary nurse and over the course of the days she made more than one emotional runner cry, demanding if their feet were really in need of the doctors. She approached me and demanded to see my feet, upon doing so she actually quite quickly agreed that I needed to have them dealt with. Luckily with it being the first stage only, there were not that many people queing and I went through into the main tent quite rapidly. To be treated by a lovely French A&E doctor called Yo. He was an expert, and had a good sense of humour – and although he laughed when I cursed the desert rocks and stones, he did slightly raise his eyebrows when he took off the tape over my toes, as did I. At the back of each of my big toenails, and my middle toe on my right foot were three very beautiful and very large pinkish fluid filled blisters, already lifting the toenails from their beds! Drained and cleaned and taped in a jiffy. My only concern now was the size of bandaging that Yo stuck around them. I was wearing individual toe socks and it was something I had forgotten to think about was getting my socks on over individually bandaged toes. Hey ho, didn’t need to think about that til the morning! I headed off to the email tent and sent my message to my brother Nick to post here on my blog for me – and then headed back to the tent for supper – beef shepherd’s pie (or so it said on the packet). The cry went up for the last runner approaching the first day’s finish line, as the light was beginning to fade – and some of us headed over to cheer him over the finish line. He was a Brit called Andrew, and bless him he looked tired as he came in, but buoyed by all the cheering he got from everyone around him, as the sweeper camels gently strode off to their part of the camp having done their job for Stage 1 and brought up the rear just a few paces behind him. The sun sets early and quickly in the desert, so after a long day it is best to head to bed quite quickly, and it is surprising how quickly we all settle down. We did establish that our erstwhile neighbouring tent had all made it in before the cut off – only just in a couple of cases. But tomorrow was another day, and as we settled down reading our messages from home which had arrived, and the rustle of Al’s crisp packet became our nightly lullaby there was the sense of relief at day one being done, all surviving and now knowing a little bit better what to expect of day 2 – a longer day with a big old Jebel (hill) in it (a Jebel that I had a distinct memory of from 2012). 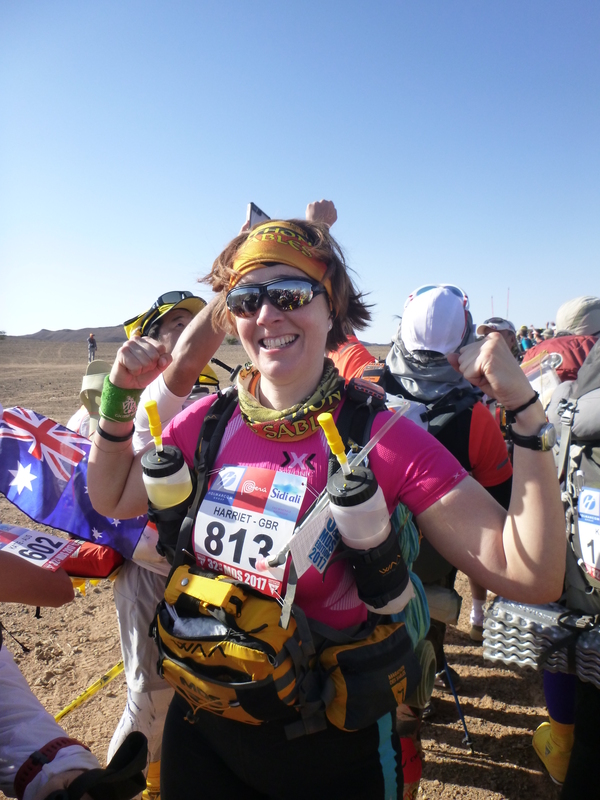 The adventure had begun, and as my brother James commented in his email to me, my photo on my MDS profile place clearly indicated that I was in my “happy place”. Yes, how right he was – a very happy place, in a dusty sleeping bag, with the warm desert breeze gently blowing through the tent, the stars coming out twinkling in the twilight, the gentle noise of chatter around the camp, the comfortable and easygoing banter in the tent – what could possibly be better! Your poor feet! I know you love the desert – but ‘ouch’! Chapter 3 is greatly anticipated.